Saks Fifth Avenue's 150,000 square foot Canadian flagship is now under construction. Hoarding is up on Saks' concourse level, which will house a food hall to be operated by upscale grocer Pusateri's. We recently visited the construction site and spoke to some planners and construction crew, who indicate that Saks should be on schedule to open in the spring of 2016. Saks' parent Hudson's Bay Company submitted an application to the City of Toronto to build the four level store on March 3. Plans we've seen show a four-level store on the Yonge Street side of the flagship Hudson's Bay building at Toronto Eaton Centre. Click image above to go to the City of Toronto Building Application. Sources indicate that Saks' ground floor will include handbags and accessories, jewellery, cosmetics, and a 5,500 square foot restaurant which will be part of a 'three level food experience', according to one store planner. A valet entrance will face onto Richmond Street and construction on the entrance is underway. Sources say that Saks will carry a variety of premium cosmetics brands and that there may be a segregation between the two stores, with Hudson's Bay itself carrying an assortment of slightly less pricey brands than Saks. According to plans, there will be multiple interior access points between Hudon's Bay and Saks. Plans also seem to indicate that there may be a new opening from the ground floor to the grocery floor below, beside existing escalators. 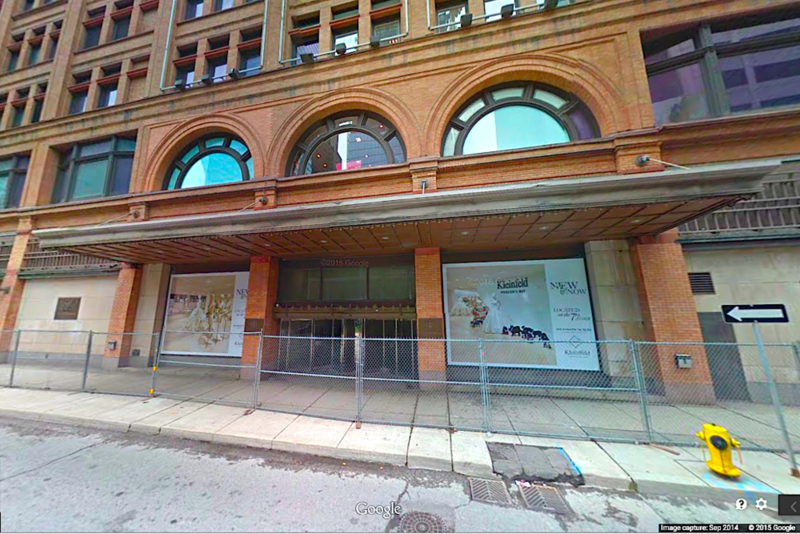 Hudson's Bay's eastward Richmond Street entrance will become a valet entrance for Saks Fifth Avenue. Photo: Google Street View screen capture. Corner of Yonge Street and Richmond Street, looking northwest. Photo: Google Street View screen capture. The Queen Street entrance to the newly combined Hudson's Bay/Saks will act as a joint entrance to both stores, according to floorplans. A common area will welcome shoppers to Saks Fifth Avenue on one side, and Hudson's Bay on the other. View from Queen St., looking east towards Yonge St. Photo: Google Street View screen capture. The ground floor of the western end of Hudson's Bay will also see substantial modifications. Canada's largest shoe floor will move upstairs for the expansion of Hudson's Bay, as new handbag, accessories and cosmetics departments are created for Hudson's Bay, which will anchor the west end of the complex towards Bay Street. Saks' second level, dedicated to menswear, will overlook the ground floor via an existing atrium. The second-level men's store will also be accessed via the Toronto Eaton Centre pedway, as seen in the photo above. Sources say that the pedway entrance to Hudson's Bay/Saks will include a concierge welcoming shoppers to Saks Fifth Avenue on one side, and Hudson's Bay on the other. A source at the company, wishing to remain anonymous, says that Saks has fought to secure some top menswear brands currently carried at competitors Holt Renfrew and Harry Rosen. Staff in Hudson's Bay's luxury womenswear department 'The Room' say that it will move to the west side of the third floor to make room for Saks. Photo: Craig Patterson. Saks' third level will be dedicated to womenswear and private shopping suites, according to sources. Hudson's Bay's luxury womenswear department 'The Room' will be moved to the western end of Hudson's Bay's third floor, according to staff in The Room, to accommodate the new Saks women's floor at the eastern end of the building. The Room will cater to younger and emerging designers in a more 'open' environment, while Saks will carry a more traditional assortment of luxury brands in a series of departments and shops-in-stores. Some office space on the lower floors of the adjacent Simpson Tower will become retail space for Hudson's Bay, according to a store planner. Photo: Google Street View screen capture. A store planner informs us that some of the lower floors of the adjacent Simpson Tower, located at the southeast corner of Queen Street and Bay Street, will be converted to retail for the expanded Hudson's Bay store. Until now, much of the space was dedicated to offices. Sources at Hudson's Bay Company have yet to confirm brands for Canada's new Saks store, and sources say that Holt Renfrew is already beefing up its operations in anticipation, including providing some of its best concessions with their own expanded spaces with street front entrances within existing Holt Renfrew flagships. We'll continue to keep you updated on the progress of Canada's Saks Fifth Avenue locations.